March begins with a stutter start. For the second week in a row, I will likely be out of school for multiple days. Last week, under a wet blanket of 10 inches of snow, we were out of school on Thursday and Friday. I'm off today as a result of the piling snow, currently at about six inches with more still coming down. I expect we will be out again tomorrow. Usually, I am pressed for time to write. Starting a new position this year - new state, new home, new school, new curriculum, and lots of new students - I have struggled to make time to blog. 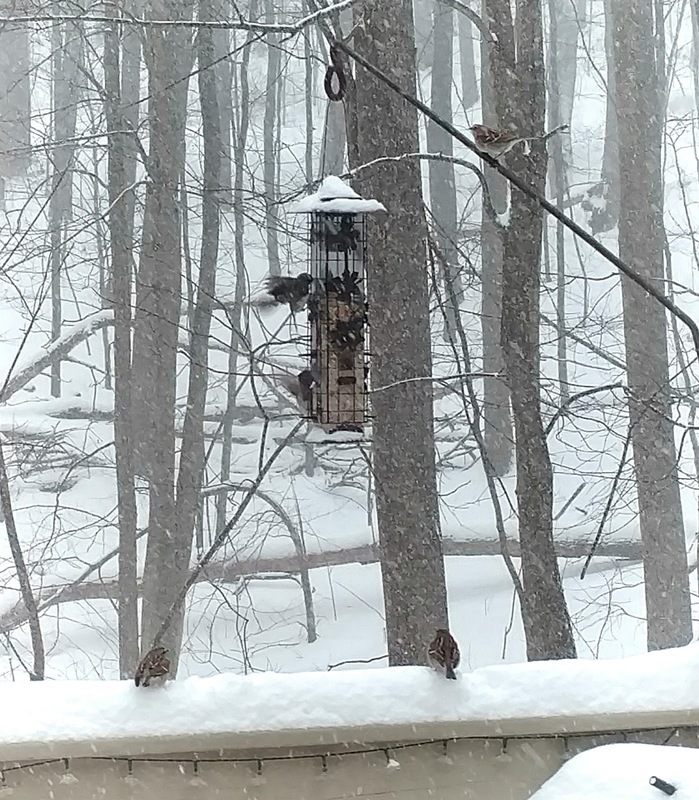 So this stutter start to March - our multiple snow days - brings with it a welcome return to reflection through the annual Slice of Life blogging challenge issued by Two Writing Teachers. The goal: blog. every. single. day. At least for the month of March. I tried to do this in earnest last year, and I nearly made it. Okay, so I only had 14 entries in March of 2015. But in 2014, I got a bit closer with 22 entries for the month and even had one of the entries published in the book Elevate Empathy. This year, I'm aiming for a perfect 31. "In February 2008, Stacey was reading one of her student’s writer’s notebooks and came across a piece of writing about his sister’s lost necklace. Christian wrote an entire entry about the outrage he felt when his mother made the family drop everything to search for his sister’s lost necklace in their apartment. Thirty minutes after they lifted up couch cushions and checked under all of the beds, her necklace turned up on her neck! There was something about his entry, this little snippet of Christian’s life. It seemed like a slice of life story. 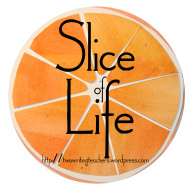 Stacey googled “slice of life” and found that it’s a term frequently used in literature and entertainment. It essentially means to describe everyday experiences with as much realism as possible. Stacey realized that was exactly the kind of entry Christian had written." So the annual Slice of Life blogging challenge asks writers to share snippets of their every day, their ordinary, to write with details about a particular moment. And so I am thankful for this stutter start to March. It is a much needed pause. Time to reflect. Time to soak in and respond to the ordinary, the every day, and to capture a moment. Too often I am concerned about what is happening next, what is over the horizon. 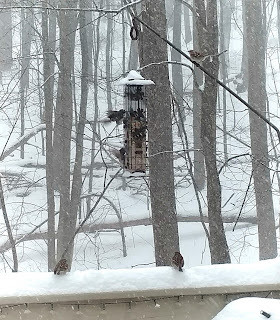 Today, I get to sit at my dining room table, watch the snow fall and birds flock to my feeder, and reinvest in my writing. At least until the kids, who also have a snow day, burst through the back door in dripping wet snow pants and bright red cheeks come in search of cups of marshmallow-filled warmth. "I don't wanna get frost-nipped, Mom, so I neeeeed hot cocoa," my little one looks up at me with laughing eyes. This blog is my hot-cocoa, my warmth. When I have felt out in the cold for too long, this is where I need to warm up, to write my way into understanding. So thank you, March, for this snow day stutter start.